Professor Peter Hoj and Chief Defence Scientist Dr Alex Zelinsky signing the collaboration agreement. 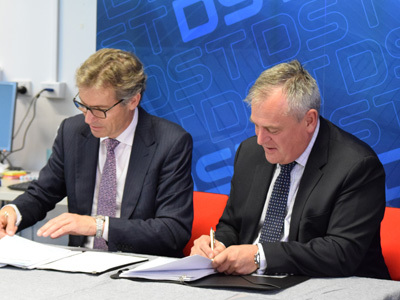 A new collaboration agreement between DST and the University of Queensland has been established to undertake advanced research in flight science and enabling technologies. The $10 million agreement will see the consolidation of both parties' test facilities to leverage the expertise of academic and industry researchers and international partners. Professor Richard Morgan, the University of Queensland's Director of the Centre for Hypersonics, has been appointed to provide expertise in the development and operation of advanced large-scale test facilities and facilitate closer collaboration under the agreement. In 2017, Professor Morgan became the only non-US scientist to have received a hypersonic systems and technologies award from the American Institute of Aeronautics and Astronautics. Australia is a world leader in high speed flight science with over 10 years of joint flight experimentation by DST, the University of Queensland and industry. High-speed flight science is one of the priority areas to be developed under the Next Generation Technologies Fund, a program focussing on research and development in emerging and future technologies.